...is a true source of comfort. 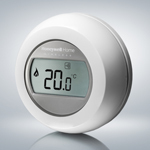 The success of the Honeywell single zone room thermostat is one of Europe’s best kept secrets. Installed in thousands of homes, this simple to use, attractive wireless room thermostat is now available in the UK. This simple to use room thermostat will make the connected home more affordable. It’s a connected thermostat that thinks it’s a programmable thermostat. It’s a wireless room thermostat that can be controlled from anywhere via the Honeywell Total Connect Comfort app. It’s a wireless programmable thermostat (time and temperature profiling via the Honeywell Total Connect Comfort app. It’s a simple wireless one heating zone solution that can be used in any system, with any boiler.